Measure around the fullest part of the chest/bust. Do not draw the tape too	tightly. With arm slightly bent, measure from back base of neck across shoulder around bend of elbow to wrist. 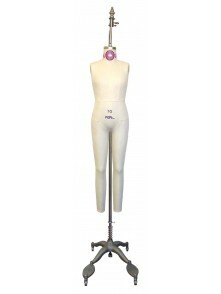 Measure from the most prominent bone at base of neck to the natural waistline. With arm slightly bent, measure from armpit to cuff. Measure around the widest section of the upper arm located above the elbow. 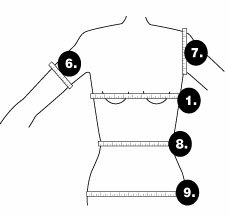 Measure from the top outside edge of the shoulder down to the armpit. Measure your waist at the smaller circumference of your natural waist, usually just above the belly button. Measure at the widest part of your lower hip. For an accurate head measure, place a tape measure across the forehead	and measure around the full circumference of the head. Keep the tape snug for accurate results. The following measurements are for crew-style or dress socks, which usually come several inches above the ankle and below the calf. To determine the foot circumference, measure around the widest part of your foot. 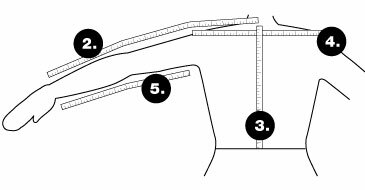 To determine the height of the sock, measure from where you start to turn for the heel shaping to the top of the sock. To measure the total length of your foot, place a ruler or tape measure on the	floor. Position the back of your heel at the beginning of the tape and the	measure to your longest toe.